Last week I posted an article over at Tibetan Political Review about the Global Buddhist Congregation that was held in New Delhi at the end of November. Since some Rangzen Alliance readers may not have seen it I am reposting it here. The Global Buddhist Congregation (GBC) that convened in New Delhi from November 27-30 made a bit of news when China reacted harshly to the Dalai Lama’s role in the gathering. Throughout several weeks of buildup to the event (which was designed to bring together Buddhists from all over the world and culminate in the establishment of a new international Buddhist organization) there was no secret that the Dalai Lama was to be the featured guest and that high-ranking Indian figures—Prime Minister Manmohan Singh’s name was mentioned—would likely also attend. China’s protest, however, only came when the GBC was just about to start. The acclaim accorded the Dalai Lama by Buddhists from around the world added a certain significance to the meeting that China may find difficult to ignore and which makes its objections to the Dalai Lama’s participation in the GBC more complex than the sort of objections it visits on governments that choose to receive the Dalai Lama in an official manner. Indeed, its objections to the Dalai Lama’s presence are fundamentally different: after all, the Dalai Lama does reside in India. That aside, however, given persistent Chinese anxieties over the possibility of being surrounded by hostile powers intent on restraining “the peaceful rise of China,” it is hard to avoid the likelihood that a gathering of Buddhists from neighboring countries such as Vietnam, Mongolia, Korea, Japan, etc., all acknowledging—regardless of sect or school—the Dalai Lama’s leading spiritual position among them, will be seen as a provocation or even a threat aimed at Buddhists (and not just Tibetan Buddhists) within China. What then might China do about this? Well, I make no claim to prescience (hence my hedging “may well be perceived”), but it seems naïve to think, given China’s periodic xenophobic anxieties, that the gathering is not seen in Beijing as a hostile act that needs to be countered. The idea of Buddhists in neighboring countries publicly elevating the Dalai Lama to a position of ever higher spiritual or moral authority is difficult to ignore. Even more troubling, one supposes, is the final act of the GBC, the resolution to establish an International Buddhist Confederation based in India. But what can China do? One is inclined to think the obvious step would be for the PRC to fall back on its own “World Buddhist Forum,” which has met twice in China, in 2006 and 2009. But given the wide-reaching display of respect for the Dalai Lama from so many serious sangha members from around the world assembled in New Delhi, one may rightly ask who would attend such a gathering now. One could only assume attendees from outside China would have to be a rather craven lot, given the repressive image that China has when it comes to Buddhism in Tibet. Indeed, a Chinese counter to the Delhi gathering at this point would likely, from a public relations standpoint, have all of the aesthetic grace and authority of the Confucius Peace Prize, an award concocted as a response to the Nobel Peace Prize given to Liu Xiaobo in 2010. Almost immediately after its creation the Confucius Prize came to be regarded as international joke. But the necessity of countering the display of veneration accorded the Dalai Lama also reveals how China has, in a sense, created its own conundrum. What counterweight does China have to the Dalai Lama? Well, there is one person, someone who has essentially been groomed for the role. But using him opens up a can of worms that one can hardly imagine China would like to see opened, for this person is none other than the Chinese Panchen Lama, so-called because he was chosen under coercion and foisted upon Tibetan Buddhists in opposition to the child recognized by the Dalai Lama as the incarnation of the 10th Panchen Lama. The problem for China is that their Panchen Lama is not accepted—to say the least—by the large majority of Tibetans who do indeed consider him China’s (not Tibet’s) Panchen Lama. The irony of an officially atheistic state discovering and certifying incarnate lamas has been noted many times but the absurdity of the situation has not lessened. And a state bureaucracy that did not pay heed to popular rejection of a Panchen Lama that it foisted on Tibet over 16 years ago is, in a word, stuck. The situation is so abnormal that the Panchen Lama is not allowed to reside in Tibet, both to keep him tethered to the government and to avoid the unpleasantness that his presence among his ostensible followers might set off. China has tried to prepare its Panchen Lama for an international role. Indeed, he was reportedly one of the candidates for the 2011 Confucius Peace Prize that ultimately was awarded to Vladimir Putin (see the comments re. “international joke,” above). He has been given English lessons and indeed was able to address the second meeting of China’s World Buddhist Forum in that language in 2009. 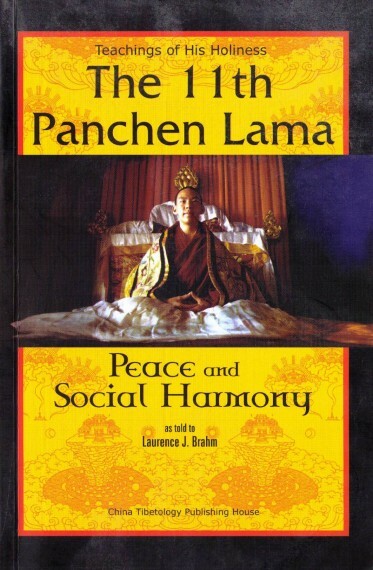 The most obvious indication of his being groomed for a role as an international guru of some sort is the fact that his name and image have been attached to a book that would not be out of place on the shelves of many bookstores selling tomes of “spiritual advice.” In 2008 Beijing published Teachings of the 11th Panchen Lama: Peace and Social Harmony, which included chapters entitled “Panchen Lama on Creating a New Society,” “Panchen Lama on Social Harmony,” “Panchen Lama on Peace,” “Panchen Lama on Finding Shambala,” “Panchen Lama on Unlimited Love,” etc., etc. While those familiar with China’s insistence on “social harmony” trumping concerns about things such as human rights should not be surprised to see quotations from the Chinese Panchen Lama on that topic, or on “creating a new society,” his quotations on other topics, such as “peace,” “Shambala,” or “unlimited love,” could have easily fit in at the New Delhi meeting. As already noted, the GBC had more than a few banal, sermon-like talks on such predictable topics. Clearly Teachings of the 11th Panchen Lama: Peace and Social Harmony was meant to be one element in an attempt to transform the Chinese Panchen Lama into an international spiritual figure. But now that the very moment has arrived in which China needs just such a figure, his problematic nature is obvious: the Chinese Panchen Lama, someone who was supposed to be the answer to a problem, is a problem in and of himself, residing in Beijing in a state of alienation from the general Tibetan populace. Put bluntly, he is a walking announcement of the lack of religious freedom in Tibet, a living and breathing advertisement for religious repression in the PRC. Clearly, if the Chinese Panchen Lama is unusable in the situation created by the convening of the GBC and the establishment of an International Buddhist Confederation it is more than a minor embarrassment for China. He has been groomed for just such a task. But simply bringing up his name will bring to mind the Panchen Lama chosen by the Dalai Lama and held incommunicado since 1995. Indeed, from the time China forced its choice for Panchen Lama on an unaccepting Tibetan population it has been boxing itself in, tying the perception of its policy on religion to a rejected figure. It is a problem that China has wholly created for itself.